Yun Xi didn’t know what his childhood sweetheart had encountered in this world, however, he knew that Hua Huo’s fighting will was as bright and burning as the sun. When Hua Huo killed the male fiery dragon and fought against the twin witches, her power had shocked Yun Xi. At this moment, Hua Huo’s aura was even more terrible compared to that time. The translucent halos under her feet looked as if she had even trampled out cracks in the air. Her every step shook the sky heavily. It was a power that Yun Xi hadn’t touched, the true power of the Sky Flying Sword. “Are you scared?” For the first time, Yun Hai looked so uneasy in front of Yun Que. “Yes. She is dangerous.” Yun Xi softly touched the green slime bracelet on his arm. He wasn’t afraid of Hua Huo’s power. In fact, after obtaining the power of a million brides, Yun Xi’s power was definitely stronger than Hua Huo’s power. However, he couldn’t do anything to her. He couldn’t hurt her. She was his first love, the most wonderful and purest memory in his heart. For a long time, Yun Xi thought that he would only love Hua Huo during his life. Even if he couldn’t stay beside her forever, because she would undoubtedly become brighter and brighter, he wouldn’t forget his love for Hua Huo. The time he spent together with Hua Huo was always happy and simple, and Yun Xi often inadvertently forgot about the great gap between them. 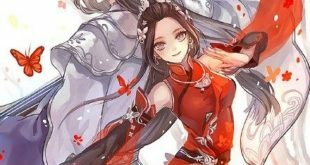 In the past, he had once imagined a day, where he would marry Hua Huo, holding her hand at the wedding. Yun Xi thought that Hua Huo also liked him. No, not like him as her lover, but liked him as her playmate. However, he believed that if he had enough time, he had confidence that she would fall in love with him. Unfortunately, Hua Huo wouldn’t stay in that small town or even in the Sky Sword God’s Domain. Her talent was beyond what normal mortals could understand. No one would consider her as a common girl. She was like the bright queen of summer and the golden sun in the sky, in the meanwhile Yun Xi was like a common cloud in the air. The cloud could be beside the sun, but as the sun kept rising, they would eventually become separated from each other. Because Yun Xi had understood this fact a long time ago, he could make his decision early. I love Hua Huo. I like the way she appears when she is running and brandishing her sword, I like her spirit of never regret and never retreat. In his eyes, she was the best lover in all the universe, however, he was just a common baker. He didn’t deserve such a fantastic lover. The sun and the cloud can’t stay together. The time that belonged to the two of them would be very short. Yun Xi loved Hua Huo very much, so he knew when he should give up and leave her. As a mortal, he would become old, ill and eventually die. they wouldn’t have a future. “To me, she is the last enemy that I can defeat,” Yun Xi sighed with a distressed look. Originally, they should’ve fought shoulder to shoulder in this world! The stars gave him a quest called “The Girl Fights Against the Evil Dragon”, which meant that he should have the chance to cooperate with her in this world! “I understand. She is indeed a tough enemy for you.” Yun Que thought that she knew what “Yun Hai” was thinking. She had experienced Hua Huo’s strong power personally. To Yun Hai who wasn’t good at close combat, she was indeed tough. The Mist Soul Army was the strongest army Yun Que had ever known, but it also had a weak point, Yun Xi, who wasn’t used to controlling his new power. This wasn’t an uncorrectable point, but to fix it, he needed time. Once Yun Xi learned how to control his Mist Soul Army, it wouldn’t be a weak point, but would become his strongest point. Having an army whose soldiers had no fear, wouldn’t die and were always faithful, it was a miracle that Yun Que had never imagined. She wouldn’t let this miracle disappear. “Don’t worry, I will protect you. You won’t die.” Looking at the strong enemy coming from the sky, Yun Que said in a firm tone. In order to save this world, she must save “Yun Hai” first, saving this man who could bring hope for this world. She had made many choices for victory, and her choice now was to protect the Emperor of the Mist Soul Army at all costs! Her Mist Soul in the Mist Soul Army was just an avatar. Compared to her avatar, her real power was much stronger. She had the only thing the White Emperor Mask couldn’t copy for her Mist Soul, because it was another Water God’s Mask. “Archer of Battlefield!” Blood started to accelerate inside her body. Her mask was becoming more and more red, with bloody lines spread on it. She could hear the thunderous sound from the sky. It was the sound made by Hua Huo’s “aura field”. Hua Huo wasn’t at the hero rank, but her power could make any hero ranked being feel frightened. Because now in this manner, she was announcing her coming! “Why? Why!” Hua Huo ground her teeth. Anger, anger, anger! She didn’t know the reason why, but she felt very angry! In front of her, there were two strangers. She didn’t feel any familiarity from their appearances and auras, however, when she found that the two people were standing together, she felt very irritated. Little Xi! Where are you?! PS: Vol.1 (from c1 to c62) and Vol.2 (from c63 to c144) of Starchild Escapes Arranged Marriage!